This page takes you through a typical garden design and construction project. Hover over the image to see the "before" image. At the bottom of the page, the clients tell their side of the story. These photos show the site when I first visited it. My clients obviously have a love of plants and indeed one of Mrs Client's requirements was to have more space to be able to plant in. The house had been fairly recently completed on the edge of Warkworth and the client had spent quite a bit of time developing a garden. 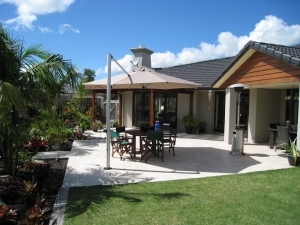 The Clients wants to get better use out of the garden for entertaining and just relaxing by themselves. She likes tropical plants and enjoys gardening but doesn't want anything that is too difficult to maintain. But there were also a couple of problems that needed fixing. When it rained, water drained towards and collected around the house and the lawn was 'like porridge' in the winter. The plants were drowning. The soil was sour - builders often leave the soil in a garden in a poor state. Sunlight poured in through the living room windows in summer and was so bright the curtains would need to be shut. The poor state of the lawn was evident as soon as I saw it so this area was going to need to be drained and fresh topsoil would be needed for the borders. The original patio was little more than a strip along the side of the house and the narrow plant border along the edge of it cut the patio off from the garden. This acted as both a physical barrier to "indoor outdoor flow" but also it acted as a visual barrier stopping the eyes from taking in the bigger picture. Indoor outdoor flow is always key in getting people to out into their gardens to enjoy them. A new larger patio was going to be needed, capable of holding a large outdoor table and chairs and this would also provide the link between house and garden. Incorporating taller plants such as palms would hide the edges of the garden and the fence, making the space feel bigger. Water is a great focal point, even just a shallow bowl. The grass, to the side of the patio, opens up the space in the garden. After the initial analysis, I prepared an outline plan for the garden for discussion with the Clients. After talking with them, a few minor changes were made and the plan finalised. 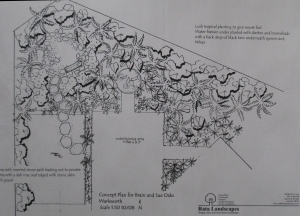 There are also a series of working drawings required for the construction phase, for example a plan for the drainage systems and for the garden lighting. As with a building, it is important to get good foundations under the hard landscaping elements. We use additional contractors where necessary and are able to draw upon a good pool of local resources with the whole construction being managed by Rata Landscapes. We had had the house built and developed the section ourselves. It has heavy clay soil and we were told that it was best to build raised borders to keep the roots of the plants out of any underlying water. We fenced the section then built raised borders around the perimeter and in front of the tiled patio area using local sourced rocks. We planted many trees and plants and a lawn was laid to cover the rest of the area. After a lot of hard work the garden began to take shape. During the summer months the plants thrived and the lawn took on a more mature look. The first winter came and with it the rain. It was soon clear that we had a very wet section and water migrated to the patio. It became impossible to do any gardening work or even walk on the grass let alone try to cut it. The grass had a sour look to it and plants that should be green all year lost there leaves due to their roots sitting in the water. The following winter was just the same and the garden became somewhere that was only available to venture into during the summer months. It became clear that something had to be done. We needed help. That’s where Neil came in. As soon as he saw the garden he started coming up with ideas. He told us that the raised borders around the tiled patio area were acting as a barrier to the rest of the garden and these should be removed. He sketched simple drawings on his pad and showed us what he had in mind. We gave him the go ahead to come up with that should include an extension to the patio, and a pergola over the lounge and most importantly improve the poor drainage. He soon came back with detailed plan for our new Garden. We liked it straight away even though it would undo all the hard work we had already put into the garden. We gave him the go ahead to start work and soon after Neil and his team arrived with a large digger and began work. All the plants and trees were carefully dug up with huge root balls and placed to one side of the garden. By the end of the second day 7 huge truckloads of clay soil had been removed, huge holes dug for the new palms and trenches dug for the extensive drainage system. From this mayhem the garden began to take shape. The concrete pad was poured for the tiled patio area, paths were marked with sleepers and filled with stones and shingle. Drains and watering systems were installed and truck loads of new soil was spread throughout. Soon large palms were delivered and planted to the plan along with other plants and shrubs. Our own plants were then placed into position. The new lawn was laid and a mulch of bark applied over the whole of the planted area. Four short weeks later the garden was finished and looked fantastic just as we knew it would. Neil has done a terrific job and our new garden looks amazing. We are very impressed with Neil’s ability to quickly size up our problem and come up with such a great solution. He was there every day organising and managing the job. Everything arrived on site when it should and there were no delays. His laid back and friendly approach disguises the skill and planning that was necessary to achieve such a stunning transformation. We now have a garden that is a true extension to our house and something very special. Our flooding problems are over and thanks to Neil and his team we are now able to enjoy our fabulous garden all the year round. Please call us today to discuss your ideas for your garden.